The Chief Minister, Mr Budhadeb Bhattacharjee, who till yesterday stuck to his stand of no talks with either Ms Mamata Banerjee or any other person on the Singur issue, today agreed to talk with Ms Banerjee. Prime Minister Manmohan Singh will present chief ministers a roadmap with emphasis on reforms to achieve a double-digit growth in the 11th Plan at the meeting of the National Development Council (NDC) tomorrow. None of the contentious Bills are expected to figure in the ongoing Parliament session as the government has failed to evolve a consensus on any of them. The Bharatiya Janata Party (BJP) today came out in favour of providing creamy layer reservation benefits within the 50 per cent quota allowed by the Supreme Court. The ruling NDA headed by Chief Minister Nitish Kumar has geared up for a total facelift of Patna in connection with the proposed first ever global conclave on “resurgent Bihar”. An encircled Samajwadi Party (SP) today went on an offensive and demanded the recall of Uttar Pradesh Governor T.V. Rajeshwar alleging that he was conspiring against the Mulayam Singh Yadav government in connivance with the Congress. After riots in Maharashtra following the defacing of an Ambedkar statue in Kanpur, tension is building over a statue of the pioneer of Dravidian movement and rationalist leader, late Periyar E.V. Ramaswamy Naicker, in the state, particularly in the temple town of Tiruchirapalli, 350 km from here. The Munabao-Khokhrapar rail link between India and Pakistan, discontinued since August 24, has been suspended for the third time. Railway Board Chairman J.P. Batra has been elected to the post of Chairman of the International Union of Railways (UIC), a Paris-based organisation for international cooperation among railways and promotion of rail transport mode. He is the first non-European to be elected for the prestigious assignment. The Chief Minister, Mr Budhadeb Bhattacharjee, who till yesterday stuck to his stand of no talks with either Ms Mamata Banerjee or any other person on the Singur issue, today agreed to talk with Ms Banerjee. He sent a formal letter to her, requesting her to call off her fast and come to the negotiating table. He said he was now ready to discuss with her Singur situation and also the state’s future industrial programme. 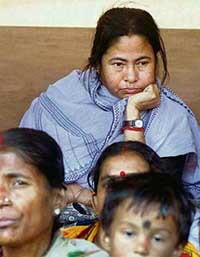 However, Ms Banerjee, who suddenly fell ill and was indisposed due to her continuous fasting since last Monday, conveyed to the Chief Minister through a senior Trinamool Congress leader, Mr Saugata Roy, in writing that she was ready to hold talks with him provided the forcible eviction and the police atrocities on the farmers were stopped forthwith. 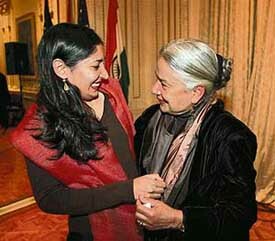 The Chief Minister, however, did not respond to her positively. Meanwhile, the police mercilessly beat up reporters and photographers of various newspapers and TV channels, who had been covering Singur agitations, at Seoraphuli in Hooghly today. At least seven mediapersons, including three photographers of private TV channels, were seriously injured. The police either broke their cameras or snatched them. Two seriously injured were admitted to the Chinsura hospital. The incident occurred when a large procession led by the CPI (M-L) and the Naxalites was marching towards Singur around 11 am, ignoring resistance from the police. The procession, however, was stopped from proceeding further at a distance. This led to a clash between the police and the angry demonstrators. The police lathi charged the demonstrators. The veteran CPI (M-L) leader, Mr Kanu Sanyal, was arrested along with three other Naxalite leaders on their way to Singur, near Barrackpore, while they were crossing the Ganga by boat. Later, Mr Dipankar Bhattacharyya, CPI (M-L) general secretary, and several other party activists were also arrested at Seoraphuli. All arrested persons, now in jail, would be produced in the SDJM court at Chinsura tomorrow. The Chief Minister, who left for Delhi in the evening, admitted that he heard about the attack on mediapersons. He added that the incident was unfortunate. He said he wanted to know from the police and the district administration what exactly had happened there that prompted the police to resort to lathi charge. In the evening, social activist Medha Patkar and the Magsaysay Award winning renowned Bengali novelist, Ms Mawhaseta Devi, at a joint press conference at the press club advised the Chief Minister to immediately stop the police atrocities on the farmers and transfer of farm lands to industries. They alleged the Chief Minister had been showing arrogance and high-handedness in dealing with the farmers and was using police force to quell their legitimate agitation. The NDC, comprising all chief ministers, is meeting here to discuss and approve the approach paper for the 11th Plan, which will begin from April 2007. The full Planning Commission, headed by Dr Manmohan Singh, and the Union Cabinet have approved the approach paper that defines the broad objectives for the next plan period. The approach paper proposes a two-pronged strategy for faster growth, which is more inclusive. It sets a target of a double-digit GDP growth in the next plan period, accelerating from around 8 per cent at the end of the 10th Plan to 10 per cent by end of the 11th Plan. It also focuses on the need for faster reduction in poverty and greater attention to employment generation and proposes a strategy for doubling the growth rate in agriculture, providing expanded access and better delibery in health and education and propelling double digit growth in manufacturing, with special emphasis on labour intensive sectors. "I am satisfied that within the political constraints, the targets set for the plan are achievable. There is nothing in the plan that is not acceptable to the coalition partners", Planning Commission deputy chairman Montek Singh Ahluwalia said while replying to query on whether plan objectives could be achieved by a coalition government. Mr Ahluwalia said he was not apologetic for anything in the approach paper and was sure that the NDC meeting would throw some major messages. He said the 11th Plan was beginning at a time when there were opportunities in terms of higher growth. Consequently, the long-delayed and controversial Women’s Reservation Bill is in cold storage while the Banking Regulation and Pension bills as well as the Factories Act have been vetoed by the Left parties despite hard bargaining by the UPA government. Similarly, Parliament is also unlikely to debate the issue of judicial activism or the Sachar panel report on the status of Muslims although both matters have generated considerable heat. Indicating as much at his press briefing today, Parliamentary Affairs Minister Priyaranjan Dasmunsi disclosed that the both the OBC quota bill and the Forest Dwellers and Tribal Rights bill, which were cleared by the Cabinet last night, would be taken up next week. The last two days of the session (December 18 and 19), the minister said, had been set aside for a possible discussion on the Indo-US civilian nuclear deal, which is likely to be accorded final approval by then. Both Prime Minister Manmohan Singh and Congress president Sonia Gandhi had publicly stated that the women’s reservation bill would be tabled in this session and the matter was even cleared at the last UPA-Left coordination committee meeting. However, RJD chief and railway minister Lalu Prasad Yadav who had given his consent to the legislation at this meeting changed tack the next day and demanded that the Prime Minister call an all-party meeting for another round of discussions. There has been no forward movement on this front since then. If the RJD has stalled the women’s quota bill, the Left front has put the brakes on the banking and pension Bills although the government has been negotiating with the Marxists for several months now. The minister was, however, confident that a number of flagship bills listed in the CMP, like the Child Protection Bill and another on the unorganised sector, will be firmed up by the parliamentary standing committees for final passage in next year’s budget session. Expressing the party's viewpoint on the reservation issue, BJP parliamentary party spokesperson Vijay Kumar Malhotra said government data had shown that many posts reserved for Scheduled Castes, Scheduled Tribes and Other Backward Classes were not filled. The creamy layer should be allowed to occupy this unoccupied quota, he said, adding that priority should be accorded to the sections which had never availed themselves of the benefits. Mr Malhotra said the Standing Committee of Parliament had given its recommendations on the SC, ST, OBC and Most Backward Castes, but the Government had rejected those. The party could not say anything on the issue until it went through the contents of the Bill, but the party would prefer that the Bill was sent back to the committee for detailed consideration, he said. On the powers and functioning of the judiciary, the legislature and the executive, Mr Malhotra said the party accepted that the judiciary had powers to review laws passed by the Parliament and state legislatures and set anomalies right. The conclave in the state capital between January 19 and 21 will follow Prabashi Bharatiya Sanmelan scheduled to be held in Delhi in the first week of January. Mr Ajay Kumar, CEO, Bihar Times, along with the Institute of Human Development, Delhi, is acting as a facilitator to bring prospective investors across the world and the Bihar Government on a common platform in connection with the conclave. Talking to the media here, Mr Ajay Kumar said the government had planned to go for an aggressive campaign to strongly position Bihar as the most happening state of the country in the years to come. Deputy Chief Minister and the Chairman of the steering committee for the conclave Sushil Modi claimed that with the growing acknowledgement of the positive changes in Bihar in past one year from different quarters, the state was poised to emerge as a developed state in next 10 year. Mr Modi informed that about 500 delegates, including those from US, UK, Europe and West Asia, as well as from other parts of the country, were expected to attend the conclave which would deliberate on various parameters of development. The conclave was also expected to come out with an agenda to guide the government in adopting the right path to bring back Bihar on tracks. The Chief Minister, however, has already ruled out the possibility of considering any special economic zone (SEZ) for Bihar. A delegation of 10 Samajwadi Party MPs met President A.P.J. Abdul Kalam here and handed him a four-page memorandum demanding the recall of the Governor in the “interest of the state”. “Mr T.V. Rajeshwar has lost his credibility to continue in the honourable position of Governor, hence he be called back immediately to protect the federal element of the Constitution of the country,” party general secretary Amar Singh said after meeting the President. Mr Mohan Singh, Lok Sabha MP, who was the part of the delegation, told The Tribune that the Governor’s conduct had been “unconstitutional” as he had been asking the state officials to “disobey” the orders of an elected government. Earlier in the day, a delegation of the BSP also met the President to demand the imposition of President’s rule in the state “without which a free and fair election was impossible”, BSP chief Mayawati said after the meeting. Saffron militants considered it as an offence after rationalists built a statue of Periyar in front of Sri Ranganathaswamy temple, as Periyar during his lifetime had ridiculed Hindu gods. According to police sources, activists of the Hindu Makkal Katchi (Hindu People’s Party) had partly demolished the cement statue with chisels and hammers early yesterday morning. The statue, situated a stone’s throw from the police station, was scheduled to be unveiled on Sunday. Four HMK activists have been arrested. The situation in other parts of the state took an ugly turn as angry followers of Periyar broke idols of Lord Ganesha and threw petrol bombs at a temple here today. The protest is fast spreading to various parts of the state. The protesters threw petrol bombs injuring two men, including a priest, close to Ayodhya Mandapam in West Mambalam here and attacked them with knives. In another incident in Villipuram district, 120 km from here, two idols of Lord Ganesha were found damaged. Hindu devotees blocked traffic in many parts of the city, demanding arrest of the culprits. The police has found some pamphlets saying the idols were damaged in retaliation to the vandalising of the statues of late B.R. Ambedkar and Periyar. Meanwhile, Chief Minister M Karunanidhi condemned the incident and requested all sections to refrain from provocative acts and not complicate the issue further. “Though different ideologies could co-exist, there is no room for such vandalism,” Mr Karunanidhi said and revealed that the DMK government had allocated 144 sq ft of land way back in 1973 for the erection of the statue. Director General of Police D Mukherjee said four constables on duty in the police station nearby were suspended for negligence of duty and for failing to protect the icon. Significantly, the Madurai Bench of the Madras High Court is already hearing public interest litigation in the matter. The Bench asked the respondents, the Thanthai Periyar Statue Installation Committee (TPSIC) to await the clearance from the court and the state government. Deputy General Manager North-Western Railway S.B. Gandhi said the Thar Express service could not be started before February as Kawas station, linking Jodhpur and Barmer, was still waterlogged and railway tracks were submerged in three feet of water. The UIC, founded in 1922, has 171 members spread over five continents. Mr Batra, who is also the Chairman of the World Executive Council (WEC) of UIC, had led the transformation of the UIC to meet the aspirations of all its members.